O.K. guys and gals I know I advertise quick and easy recipes but surely as editor,compiler, cook and chief bottle washer I deserve the right to throw in the occasional curved ball or a slightly more complicated dish.Please don't let that put you off there are quite a few elements to this dish but taken step by step it is a averagely easy dish the only downside is the prep time of around 3 hours but I can assure you it will be more than worth it. This dish is really a huge Chocolate feast whether you like dark,milk or white chocolate it is all here in this dish and the combinations of textures and flavours really do endorse this dish that is fit for any special occasion or just for your own family,s indulgence so please enjoy any comments welcome. Melt the butter in a pan then transfer to a bowl. Break the cookies into quarters and drop into a food processor. Blitz on a low setting – once started, add the nuts through the feeding tube and then the sugar. Stop blitzing the biscuits as soon as you can see that there are no large pieces at all and the mixture is like breadcrumbs (approximately 20 seconds). Try not to over-process the biscuits as the texture will be too fine if you do. Add the crumbs to the bowl of melted butter and stir well to combine. Line six 6cm ring moulds with foil that folds over the outer edges. Lightly oil the inner surface of the foil with the groundnut oil. Divide the crumb mixture between the moulds and press down firmly with the back of a metal spoon, making sure the edges are really neat and the base is flat. Place the tray into the fridge to chill and set while you make the chocolate layers to go on top. 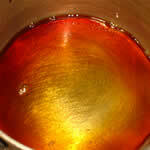 Add the sugar and 75ml water to a pan on a medium heat and stir until it dissolves. Then turn the heat up and bring to the boil, boiling rapidly for about 3 minutes (watch it all the time and do not allow the sugar syrup to over-boil and colour – if it does then it may have burnt and you’ll need to start again). Leave to cool for 2 minutes. Whilst the syrup is cooling, add the egg yolks to a high-sided bowl/jug and whisk with an electric hand-held whisk. When it’s cool, very slowly and gradually pour the sugar syrup into the egg yolks while continuing to whisk. Keep going until the mixture thickens and becomes pale and the beater leaves a ‘trail’. Leave the mixture to one side for a moment and start melting the chocolate. Break it into small squares and place it in a glass bowl that will fit into the top of a pan in which you have an inch of barely simmering water (heat it on the lowest setting). Add the double cream to the egg mix and whisk again until completely combined and slightly fluffy. Return to the melting chocolate and add the butter to it. Stir continuously to mix it in and ensure that the chocolate is melted fully. Fold the melted chocolate and butter into the cream/egg/syrup mix until thoroughly combined then pour it into an ice cream machine and churn for 20 minutes (or as per your machine’s instructions). Meanwhile, roughly grate the extra chocolate and add just two minutes before the ice cream is due to come out of the machine. Scoop the ice cream into a 900ml airtight plastic box and place in the fast freeze section of your freezer. The ice cream needs to be left at room temperature for approximately 25-30 minutes prior to serving. Melt the chocolate by breaking it into squares and placing in a glass bowl sitting on a pan of barely simmering water. Meanwhile, weigh out the crème fraîche (adding the vanilla bean paste for the white chocolate layer) and yoghurt into a high sided bowl and whisk for 30 seconds with an electric hand whisk. Once the chocolate has melted add the salt and stir in well, making sure no crystals remain. Pour the melted chocolate into the yoghurt mix and whisk for 1 minute until it starts to thicken and is thoroughly blended in. Divide the mixture equally over the biscuit bases and smooth with the back of a metal spoon. Return the moulds to the fridge to chill while you prepare the next layer. Repeat the method as for the first layer for the milk and white chocolate layers, but adding the espresso powder instead of the salt for the milk chocolate layer. Chill the dessert in a very cold fridge for as long as possible, but preferably at least 4 hours. Very lightly grease suitable curved metal / glass items (e.g. an individual baking ring, the bottom of a small pudding mould, the back of an ice cream scoop) and place them on a large non-stick baking tray. Also have another baking tray, egg cooking ring, a pair of tongs and a long handled latte/sundae spoon to hand. Weigh the sugar into a small heavy-bottomed non-stick pan and put on a low-medium heat, stirring occasionally with a silicone spatula. Keep a close eye on it the whole time so that it doesn’t catch and burn. As soon as the sugar has completely melted and is liquid, take it off the heat and stir in the cayenne pepper thoroughly. If you’re using curved baking rings, hold them with the tongs. Take a spoonful of the liquid caramel and drizzle it backwards and forwards over half of the ring. Repeat with all of the rings or moulds. Using the remaining caramel, drizzle spoonfuls from a height of about 20cm over the other baking tray with an egg cooking ring on top as template, flicking the spoon back and forth as quickly as you can. Once the caramel has cooled and hardened, remove the curls/baskets from the rings/moulds and very gently trim the shapes that you have made on the baking sheet. Add them to the dessert just before you serve it. Mix the cream, butter and sugar in a glass bowl over a pan of barely simmering water on the lowest heat (without the bottom of the bowl touching the water) and stir until blended and dissolved. Turn off the heat. Break or chop the chocolate into small pieces and add to the cream mixture. Stir until fully combined. Whisk the mixture lightly with a mini hand whisk while adding the Cointreau, 1 teaspoon at a time, mixing each one in thoroughly before adding the next. If the sauce is still slightly too thick to be a good pouring consistency, add a little tepid water and mix in thoroughly. Pour into small sauce pots and serve to the side of the dessert. Some may be used to decorate the plate and a small drop is helpful to stick down the chilli caramel basket/curl to stop it sliding on the plate. After removing the desserts from the fridge, leave them to stand at room temperature then top with a chilli caramel lattice just before serving. Serve with a scoop of ice cream resting in a chilli caramel curl/basket and with the warm chocolate fudge sauce in a small pot on the side. 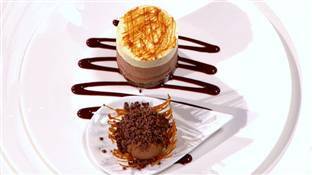 If you prefer, top the ice cream with grated chocolate, some of the toasted hazelnuts or spare shards of the caramel. Marie Antoinette, was the first Queen to bestow the title, ‘by appointment to the Queen’ on her personal chocolate maker in 1770. I love every last layer of this delicious treat! Also the presentation is awesome. For this kind of result-the 3 hours of time would be of no consequence. Great post-buzz. Believe me It really is as good as it looks.Go on give it a go let me know how you get on.